Alice in Wonderland Funko Pop Released Today! 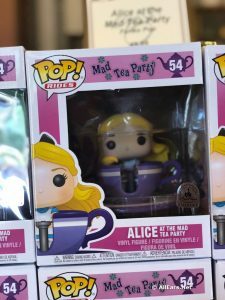 The newest Funko Pop release is the Alice in Wonderland at the Mad Tea Party -- it's out today, January 26 at select locations around Disneyland and Walt Disney World Resorts. As you probably already know, the World of Disney stores at both Disney Springs in Orlando and Downtown Disney District in Anaheim have been undergoing extended renovation that started in February of this year. One of the AllEars.Net team was wandering around the Disney Springs Marketplace the other evening and captured a few photos of this work-in-progress, so we thought we&apos;d share and get your thoughts. At the D23 Expo in Tokyo, Chairman of Walt Disney Parks & Resorts Bob Chapek shared an update on the progress of the highly anticipated land, Star Wars: Galaxy’s Edge. He also shared a sneak peek at the unique Toydarian merchandise guests will find exclusively in the land. 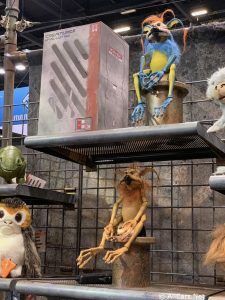 At Star Wars: Galaxy’s Edge, guests will … Continue reading "Toydarian Wares Coming To Star Wars: Galaxy’s Edge"
If you or a loved one are a Disney enthusiast (aka geek) and are stumped at what to buy for a birthday or holiday present, then continue reading. I have a whole gamut of gift solutions for you (and me). For the Disney Parks Repeater (someone who visits Walt Disney World or Disneyland over and … Continue reading "Gift Ideas for Disney Fans"
by Emily Owens Pickle Guest Blogger In 2010, Disney launched the new face of Disney Store. Disney Store was launched in 1987 and fall 2011 starts a 25-year anniversary kick-off. One of the redesigned locations opened last week near my home. While running some errands last week, my family and I decided to check out … Continue reading "Disney Store: New Look, Same Magic"
Copyright Â© 2008 Barrie Brewer, Nikon D300, 18-200mm VR, 1/13s shutter, f4.8, ISO 800 Hanging out at the carnival games on the Boardwalk, a wall full of monsters wait for their turn to go home with a lucky game player. Until then, these plush toys call the Boardwalk Inn home. Our theme for this week’s … Continue reading "Disney Pic of the Week – Toys"